Colin Davis should have been conducting his 85th birthday concert with The London Symphony Orchestra at the Barbican, but he was taken ill . "I hope to be home soon", he said in a message read out to the audience. In the circumstances any disappointment must be moderated by good wishes for his recovery - and the health of Mitsuko Uchida, the scheduled soloist who also had to cancel. These things happen, and I wish them well. The good news was that Martyn Brabbins stood in. Brabbins is a fixture on the British conductor circuit, extremely well respected. His technical foundations are rock solid, yet he's adventurous and free spirited. Once I bumped into him when he was wearing ghoul makeup for David Sawers' Rumpelstiltskin (more here). Huge grin! Brabbins' range is eclectic, but he specializes in 20th century British music. So it was good to hear him conduct Anthony Payne's elaboration of the materials which might have led to Elgar's Third Symphony. Payne's Elgar isn't a "completion" but rather the result of Payne's engagement with Elgar and his mental processes. "I had to 'think Elgar'", he has said. There's a whole book on the experience Payne went through. The Elgar fragments are developed both as an extension of Elgar's ideas and as the response of a British composer writing with 70 years of further experience into the world Elgar left. It's "not" Elgar, though there's enough to tantalise. The "summer" themes, for example, evoke many Elgarian ideas. Payne stimulates us to think about Elgar in the light of our own responses to the composer. It's an extremely creative approach, which makes us reflect on how we respond to any music. Brabbins' approach to Payne/Elgar is vivaciously energetic, which might not suit those who like their Elgar staid. But that in iteself is an insight. Brabbins negotiates the changes of perspective briskly, bringing out a very strong sense of dialogue, which, for me, is the secret of the piece: Payne's reflections on Elgar show how understanding is shaped by our own insights. With the LSO, Brabbins creates a vivid sense of Payne coming so close to Elgar's mind that he's doing a lot more than just dollying up bits of Elgar. This performance was much livelier than Brabbins' account at the BBC Proms eight years ago. That shows how Brabbins himself keeps developing and hearing things afresh. Sakari Oramo's CBSO performance in 2007 was excellent, but Brabbins' sense of Payne's personality gave this latest interpretation a distinct edge. Payne identified so closely with Elgar that he effaced himself, but Brabbins brings out the warmth and inventive spirit of Payne as well as of Elgar. It was a greater tribute to Colin Davis to hear Brabbins, one of the leading exponents of Payne/Elgar, conduct because it was a reminder that, while we grow old, music lives on. The continuum doesn't break. Richard Strauss Vier letzte Lieder as Birthday Tribute was a much more questionable choice, given that Strauss was contemplating death. Sally Matthews sang with obvious sincerity, but sacrificed articulation in the process. The pace dragged, self conscious and dirge-like. "Beim Schlafengehn" walked in its sleep. In the circumstances, Colin Davis might be more cheered by a more idiomatic performance. Gordan Nikolitch directed Mozart's Symphony no 35 D moll The "Haffner". This is a piece that depends on good ensemble and a good leader. Normally we wouldn't even notice there's no conductor. It's not a reflection on the LSO, who were fine, but this time the absence was poignant. "The tragedy of fate drives two people apart. The husband's passion for his work leads him to overlook his wife's beauty, and the woman herself cheated of her youth and physical appeal, becomes a slave to apathy, dejection and open hatred. To bring the two back to reality, a terrible catastrophe is called for. This is a real tragedy because one life has to be sacrificed to save two others. And you, of all people, have failed to understand that?" So wrote Alexander Zemlinsky to Alma Mahler when she objected to the premiere of Eines Florentine Tragodie (A Florentine Tragedy). The work was conducted by Vladimir Jurowski at the Royal Festival Hall last night. The lines are quoted in Anthony Beaumont's pioneering biography of Zemlinsky, (2000) by far the best authority on Zemlinsky ever. Beaumont is seminal, not only because his work was so original, but because he navigates his way around the myths that have grown up about the composer. He dismisses, for example, the influence of Korngold, who was only 18 when A Florentine Tragedy was written. More importantly Beaumont shows how Zemlinsky can be appreciated other than through Klimt-gilded sentimentality. Zemlinsky's far more challenging. Zemlinsky's A Florentine Tragedy employs luxurious excess - glorious swathes of shimmering strings, arpeggios that flicker like golden light. One could be seduced by such gorgeousness and swoon into the same trap as Bianca fell into when she married. Or Alma, for that matter. The sumptuousness of A Florentine Tragedy is a tragedy, make no mistake. Its sumptuousness deceives. Those fooled by glamour lose their souls. Interpreting Zemlinsky on a superficial level is to miss the emotional rigour at the heart of his work. Throughout much of his life, Zemlinsky returned to the "Alma theme", where an ugly man is rejected by a beautiful but shallow woman. He's not nursing his wounds so much as finding a metaphor for art. Zemlinsky wasn't good looking but he created beauty because he was an artist, overcoming obstacles. When Simone kills Guido, Bianca falls in love with him because he's "strong". Is violence a sign of strength? Have this pair any idea of the consequences of killing Guido The Prince of Florence? Psychologically, nothing rings true about this conclusion, if the opera is understood only as thwarted love story. Simone is far too sharp to trust Bianca. We don't know how the story might have ended if Oscar Wilde had finished writing it. But that suits Zemlinsky, who can instead focus on the inner drama of artist and art. Simone does most of the singing: Guido and Bianca are largely ciphers. Albert Dohmen was clearly unwell. He looked flushed, perspired and drank a lot of water. Fever? If his projection was under par, his phrasing was precise, and got the notes even with less fire than he might otherwise. In the circumstances, it was a heroic performance. He was clearly suffering, yet he did his duty as an artist. True to the role! In the Royal Festival Hall, Sergei Skorokhodov (Guido) and Heike Wessels (Bianca) were hard to hear. On the broadcast, the BBC engineers adjusted the balances in their favour. Always in live performance, you must make allowances. In any case, Zemlinsky's writing a monologue for Simone, with the other roles as props. Interpretation is pertinent to performance. Jurowski's Zemlinsky is lovingly soft focused. Has he heard past the myth of Vienna City of Dreams? He can't be blamed, for this approach is so prevalent these days that it smothers engagement with the music and individuality of composers. Unfortunately, too, because some audiences are hostile to any whiff of modernity, in politics as well as in music, they won't stand for anything but doggedly retro, even if it means not listening too carefully. Let us remember that Zemlinsky and Schoenberg were dear friends until Mathilde Zemlinsky's affair with Richard Gerstl, which ended in Gerstl's suicide. "One life has to be sacrificed to save two others". Individual concerns superseded by the triumph of art. 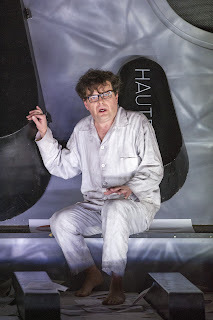 Far from being banned from seeing Alma, as she melodramtically asserted, Mahler let Zemlinsky give her music lessons, gave him work and would have conducted his Der Traumgörge had Mahler's contract with the Hofoper not been terminated two days before the premiere. All the more reason for interpreting A Florentine Tragedy as the struggle for artistic integrity. Simone's "strength" isn't physical but artistic. The London Philharmonic Orchestra are so good that they detail the music nicely, even if there was no sense in this performance of greater complexity. I learned my Zemlinsky from James Conlon, but his work is infinitely superseded by conductors prepared to go deeper. The closest we get to a penetrating Florentine Tragedy is the recording by Riccardo Chailly. Gerd Albrecht and Armin Jordan are also recommended. In the first half Jurowski conducted orchestral episodes from Richard Strauss Die Frau ohne Schatten. Eighty years ago it was common to hear programmes of "bleeding chunks", so there's historic precedent. Modern ears, trained by easy access to whole recordings, don't take so easily to the style. I didn't go expecting to hear the opera, so listened to the excerpts as "abstract sound". On this level, the innate theatricality of the orchestration shines through. Strauss throws in all the effects he can – on stage trumpet and trombone band, wind machines, thunder machines, military drum, two celestes, glockenspiel and glass harmonica. The London Philharmonic Orchestra played with colour and gusto. Once you get past the idea of the "missing" opera, you can enjoy the orchestra having fun. Plenty more about Zemlinsky on this site. Ronald Corp conducted Frederick Delius A Village Romeo and Juliet at the South Bank.with Christopher Maltman, Andrew Shore and others. I didn't go since I'm out five nights of seven this week. But it would have been interesting. Like most of my generation, I learned Frederick Delius A Village Romeo and Juliet from the recording with John Shirley-Quirk, Robert Tear, Benjamin Luxon, and the John Alldis Choir. The Royal Philharmonic Orchestra was Beecham's orchestra and they would have imbibed his approach. This recording is the classic for this reason: Beecham defined Delius as a British composer for many generations. But did Britishness strangle Delius interpretation? Significantly, Delius did not set Shakespeare's Romeo and Juliet, but Gottfried Keller's late nineteenth century Germanized version, Romeo und Julie auf dem Dorfe, where the poet deliberately changes the lovers' names. Delius was well read and almost certainly knew of Keller's novel Der grüne Heinrich, and of the poet's reputation as a radical rebel. That's what drew Hugo Wolf to Keller, even earlier. So bang goes the idea that A Village Romeo and Juliet is no more than pastoral, English nostalgia. Delius was international. For him, Bradford might have felt claustrophobic. After living among the natives in Florida, he spent his life in France. Had he not contracted VD he might have stayed among the racy, cosmopolitan set in Paris. A Village Romeo and Juliet was written in 1901, at the height of Empire. Delius was colonized, just as the rest of the world was colonized. Delius could be appropriated as a doughty rejection of Wagner, Strauss, Debussy and them foreigners. To this day, British music circles still bear the mindset of Eric Fenby. For some, being British is more important than being artistic. So poor Fred is remodelled as British Bucolic. Opposed by their parents, Sali and Vreli need to escape. "Here we cannot stay" sings Sali, "I know another place". The bells triumph, timpani routing the dissolution. The Walk to the Paradise Gardens is usually heard on its own, out of contect. Hearing it as part of the whole opera completely changes its meaning. When a lone violin is heard apart from the tutti, do we hear it as pretty detail or as the Dark Fiddler, hovering in the background? The Paradise Gardens is a dissolute tavern where the Fiddler and other lowlifes sing of "Freedom". Sali and Vreli are heading to Paradise, but not quite as blissfully as one might think. Shimmering strings, plateaux of pure sound. Eventually, the lovers head down a river to their deaths. Think Wagner. Is A Walk through the Paradise Gardens downstream from Siegfried's Journey down the Rhine? "The children love, their parents hate, and nobody knows the end" sings the Dark Fiddler. Sali and Vreli committ suicide by drowning in the depths. Is this a sentimental opera? As a fantasy of happy yeomanry, maybe. But Sali and Vreli are alpine peasants, they live tough lives and don't faff about. This completely changes the tone of the opera. Can A Village Romeo and Juliet be heard as a precursor to Franz Schreker's Irrelohe? (more here). Is Delius writing a strong-minded moral parable? Like the Dark Fiddler, Sali and Vreli must pay for the sins of those before them, but they chose to do so of their own accord. Romeo and Juliet died because their fancy plans messed up. Delius's A Village Romeo and Juliet isn't grand opera, quite the contrary. Although choruses predominate, the choirs represent simple peasants. 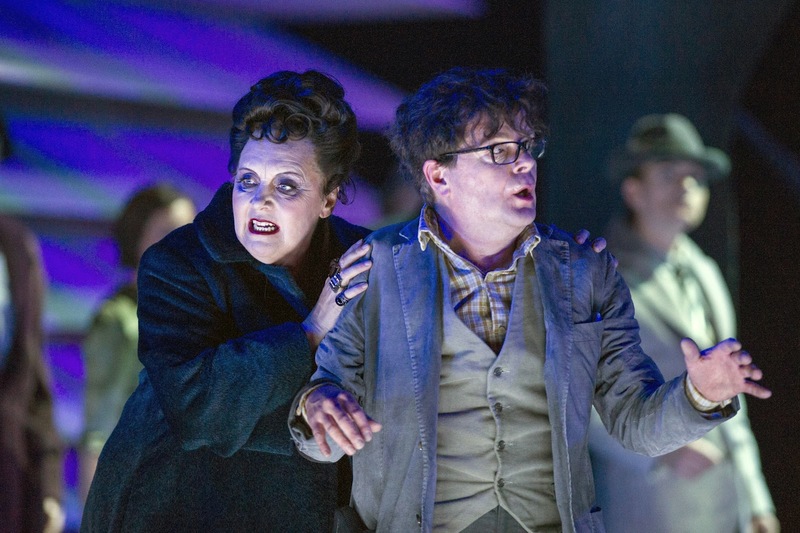 Its uncompromising moral rigour simply does not suit elaborate theatres like the Royal Opera House, which is why I wasn't the least bit surprised when ROH decided against staging it. It's being done next year at Wexford, where the smaller scale will suit it better. Is it sheer coincidence that Keith Warner's heavily marketed Wagner Ring of the Nibelungen opens at the Royal Opera House London at the same time as the Oktoberfest opens in Munich? Commercialism rears its ugly head! But at least in this case, one can reflect that sixty years ago audiences knew what "Rheingold" meant and associated it with liquid gold. Notice the bombastic "orchestra". Perhaps those audiences even got the irony of using arch anti-capitalist Richard Wagner in a crass commercial. What is the message of Das Rheingold and of the entire Ring Cycle? Whoever holds the Ring is cursed. Alberich rips off the oppressed Nibelung working class. Wotan rips off Alberich. Fafner and Fasolt scrap with each other. Wotan's scams go far wider than cheating on a mortgage. He cheats on his wife. He doesn't "do" responsibility, even when he tries to protect his daughter. Hagen and Gunther think they can rip off Siegfried. "Des Ringes Herr als des Ringes Knecht" Alberich's curse applies to himself since he stole the Rheingold in the first place. An indictment of the Capitalist system! Thickets of moral compromise. So grüss' ich die Burg, sicher vor Bang' und Grau'n! sings Wotan as he accepts his entitlement. But heed what Loge has to say : Ihrem Ende eilen sie zu, die so stark in Bestehen sich wähnen. Fast schäm' ich mich, mit ihnen zu schaffen; zur leckenden Lohe mich wieder zu wandeln, spür' ich lockende Lust. The Ring is for the rich. Plebs need not apply. But as beer, Das Rheingold is available to all. For details of the ROH broadcast schedule, please see here. 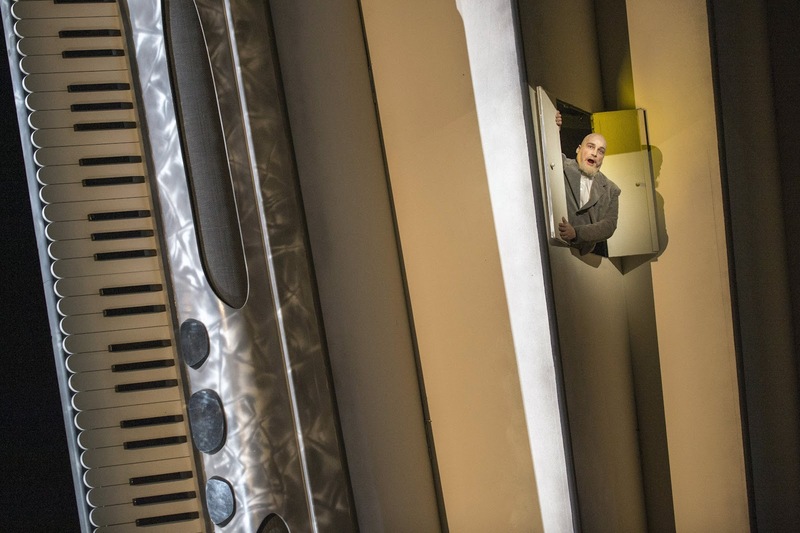 Huw Watkins's opera In a Locked Room starts at the Linbury at the Royal Opera House this week. (Read about the Edinbugh premiere here). Huw Watkins is a famous pianist, but as composer he's best known to those who've heard live performances and read his scores. He's a significant composer, so this new recording, on NMC, will establish his reputation in wider circles. Watkins's Sonata for Cello and Eight Instruments dates from 1999, and was previously only available on CD in piano/cello transcription. In this version (recorded 10/2010) Paul Watkins's cello is supplemented by the Nash Ensemble, conducted by Ian Brown. The woodwind parts are alluring, mediating between cello and piano. Watkins's gift for clarity comes over well in Partita for solo violin (2006). Despite the allusion to Bach, it's not baroque. As Bayan Northcott says in his notes "no double dotted rhythms, no courante, sarabande or gavotte". Alina Ibragimova, the dedicatee, negotiates its tricky turns gracefully, so the wayward molto allegro sounds vivid, even humorous. Four Spencer Pieces (2001) for solo piano, played by the composer himself . Each of these miniature tone poems was inspired by a specific painting, like "Shipbuilding on the Clyde" and "The Resurrection of Soldiers". Stanley Spencer's paintings show ordinary events but lit by preternatural light, every detail crystal clear. The "pictures" are framed by a Prelude and a ravishingly beautiful Postlude in which cascading cadences suggest light, clarity, contemplation. Watkins isn't "illustrating" the pictures so much as expressing the earthy surrealism of Spencer's work, so the rapture of the Postlude is extraordinarly perceptive. This exqusite miniature is the highlight ofthe whole recording. Like so many British composers before him, Watkins turns to W H Auden. Three Auden Songs (2009) are settings of Brussels in Winter, At last the secret is out, and Eyes look into the well. Thorny text lines twist. The mood is menace. "Still waters run deep, my dear, there's never smoke without fire"...."There is always a wicked secret, a private reason for this". An understated refrain but naggingly persistent. Dylan Thomas's craft was poetry, but Watkins's setting of In my Craft or Sullen Art (2007) suggests that poetry, like alchemy, has the power to transmute base material into magic, "exercised in the still night when only the moon rages". A strange unworldly cello entices us in, and the first voice setting is relatively straightforward. A second, longer section for the Elias Quartet, singing together with their strings. Perhaps this is an interlude, but it feels central to the piece, sparking off a completely different setting of the same poem. This time the mood is agitated, insistent. The words "In my Craft or sullen art" are projected like a cry. Mark Padmore adapts his usual smooth urbanity so it captures the surreal nature of the piece. At times he sounds uncannily like Ian Bostridge. This isn't a work for voice and string quartet so much as a work for string quartet with additional voice. In the final strophe of the second setting of text, the strings subsume the human voice, and take over where it leaves off. That's Huw Watkins's "Craft": singular and very original. I've been reading the libretto to In the Locked Room and will be writing more on Huw Watkins's new opera soon. The Magic Flute - a new take ! At last, a recording of Robin Milford's Mass for Five Voices op 84 from Stone Records, specialists in British repertoire. Robin Milford (1903-1959) was Oxford born and bred, so it's fitting that this major new recording comes from the Choir of Somerville College, Oxford, conducted by David Crown. Milford would have been thrilled, though in his day, Somerville was all-female. While Somerville doesn't have the cachet of the bigger colleges, its singers are enthusiastic, and their committment infuses this recording with great character. Milford is best known for his music for small ensemble, like Fishing by Moonlight (op 96) issued by Hyperion nine years ago, so Stone Records' recording is an important development. Mass for Five Voices (1945-7) was originally titled "Mass for Christmas Morning" but there's nothing specially Christmassy about it other than a general sense of joy. "I'm so glad that you enjoyed my Mass", wrote the composer to a friend, "for I consider it the best thing I've ever done, and I'm very pleased indeed that you felt the work was 'truly religious' rather than 'churchy'" . The voices are SATB choir with organ, so the resemblance to church tradition is clear, but Milford's approach is ecstatic. In Gloria in excelsis, the voices shine. "Miserere nobis" hardly seems relevant, a final "Gloria in excelsis" reaffirms the celebratory.mood. Even the solemnity of the Credo reflects joy, and when the organ joins in, it's as if it were singing, not preaching. The Somerville voices sound so fresh and pure that one can understand why Milford thought of Christmas and presumably angels and happiness. There's nothing trite about this. Milford's life was plagued by tragedy, including the sudden death of his 5 year old son. He had breakdowns, received ECT and attempted suicide, and finally ended his life with an overdose. Even in our modern, more tolerant times, such things are painful. In Milford's era of repressed Stiff Upper Lip, he must have suffered. So the joy in Mass for Five Voices shines all the more when we reflect from whence it came. The Somerville College Choir are joined by soloists Christine Rice and Mark Stone for Maurice Duruflé's Requiem op 9 (1947). making this recording of interest even in a crowded market. Rice and Gilchrist communicate sincerity. Duruflé's Requiem is duly famous, and its use of monastic chant sources give it timeless grandeur. Yet, as James Percval writes, "in the light of the socially-traumatic experience of World Wars", Duruflés Requiem "very much belongs to the twentieth century". Listen to Christine Rice in this Pie Jesu, the stillness in her voice garlanded by cello (Guy Johnston) and organ (Tristan Mitchard). A protracted single organ announces the Libera me. When Stone sings "tremens factus sum ego", he sings with such directness that his words feel personal and heartfelt. This Requiem was recorded in the chapel at Douai Abbey, where the acoustic favours intimacy. Duruflé's Requiem and Milford's Mass for Five Voices were written in the same post-war period., but are, of course very different. But heard together, we can appreciate the humanity they have in common. This recording is a milestone for Milford, but also a showcase for the Oxford college choir tradition, created afresh by the Somerville College Choir. It seems odd to call a CD of Masses a "hit", but this one is ! For more details, please see the Stone Records site HERE. The ENO gave the British premiere of Bohuslav Martinů's Julietta many years ago, so this new production was eagerly awaited. But what will audiences new to Martinů get from this production? It's a myth that the English language makes opera more accessible. That just means audiences focus on words, rather than really listening or understanding. Martinů's Julietta is a highly conceptual opera, with deliberate ambiguities and mind games. Just as in dreams, there are clues and contradictions. If ever there was an opera where listeners had to keep alert and pay attention, this is it. The opera predicates on dream states, but sleepwalking through Martinů's Julietta isn't wise. 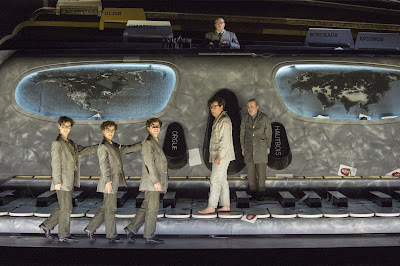 The production dates from 2002 when it was first seen in Paris. The Overture opens to images of sleeping figures floating in space (or amniotic fluid). One figure emerges, Michel Lepic (Peter Hoare), bookseller by day, dreamer by night. The main set is a giant mock up of an accordion, which also serves to suggest the walls of a house from whose windows various characters appear at critcial points in the opera. Musically, this is perceptive, for Martinů writes an evocative solo for accordion into the first act, and the mechanics of the instrument suggest "lungs" or breathing. Accordions also evoke folk music, and thus memories of the past. A horn player walks round, his music evoking other, more sophisticated memories, offereing hope to those who have lost the past. In this strange dream village, no-one can remember anything of the past. Nothing connects. If this is a landlocked European village, why is there a ship? Where do the Old Arab (Gwynne Howell) and Young Arab (Emilie Renard) fit in? The implication is that without memory, we're eternally adrift. It is significant that Martinů returned to Julietta at the end of his life, after decades of wandering through Europe and the United States.This gives the opera emotional depth, and is important to interpretation. As a musician, Martinů was sensitive to the power of music, where small snippets awake vast rivers of memory, so the many references to other music are deliberate. Even if some are barely more than wisps, their embedded presence is part of the meaning. The giant accordion turns and moves, but within the orchestra Martinů writes fragments for solo instruments or small units like 3 oboes. The vast world theatre, and the tiny individual. This theme runs through the opera on several levels. Michel is alone in the busy village, and in the Central Office of Dreams he can't beat the bureaucratic machine. In the last act, the Accorion turns over so it resembles a giant, hideous skull, its keys reesembling the keys of a piano, the working tool of most composers. Apart from Michel himself, the characters appear in different forms, and the Three Gentlemen in Frock Coats (as described in the score) sing in unison. Even Julietta (Julia Sporsén) is illusory, and needs to create an articial past through the postcards the Seller of Memories (Andrew Shore) peddles to the unwary. Gradually Michel is drawn deeper into delusion. Who shoots Julietta? Did she, can she die? It doesn't matter. People in this cosmos have no attention span. But as an audience, we do, which is why small details count, however elusive. Anarchic as dreams are, performance should be rigorous. Martinů writes lusciously lyrical figures which seduce the ear, magically. But the Third Act tells us quite categorically that one cannot escape into the luxury of reverie. Beneath this lovely score lies a bedrock of anxiety. Is Michel all that different from the other inhabitants of this dream? He sells books (fiction?) after all. The Convict and the Blind Beggar are fixated by the same dream that takes the form of a lovely, elusive woman. Tension, anxiety and claustrophobia are fundamental to this music. Sharp staccatos, like the ticking of a clock, alarm bells. Yet at the ENO this sense of impending cataclysm was defused. Edward Gardner's Julietta is a pretty, light hearted reverie, not nightmare. The defining extremes in this core are smoothed over, so the firm structure of the opera becomes fragmented. The singers, even the better ones like Hoare, Shore, Howell, Susan Bickley, Henry Waddington, Emilie Renard and Jeffrey Lloyd Roberts are solid rather than haunting. 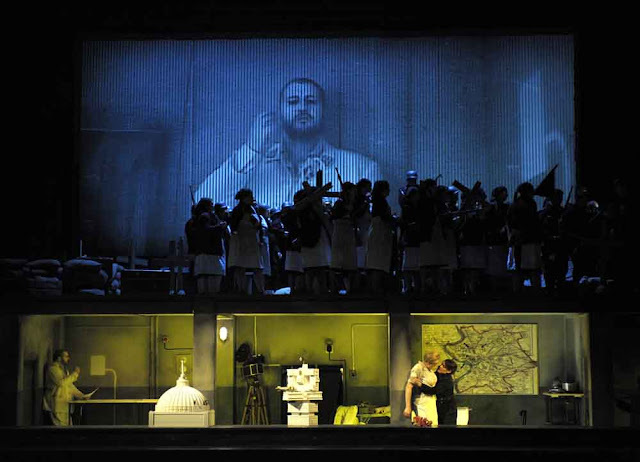 Martinů 's Julietta is not easy to stage but ironically the visuals (directed by Richard Jones, designed by Antony McDonald) were far more effective than the performance. We need to see this production because it's historic, and good. But anyone who wants to hear what the opera really should sound like should stick to the recordings. Krombholc (1964) is top recommendation, Mackerras conducts only fragments. When the complete new edition, recorded by Jiří Bělohlávek in 2009 is released, that will be the one to get. I've been listening to an aircheck of the broadcast. Even on an amateur quality tape, the true spirit of Martinů 's Julietta shines through, magical and manic in turns. There have been several stagings of Martinů's operas in recent years, and of course the full symphonic cycle, but Julietta is outstanding. This ENO performance doesn't begin to reach those heights. I can't blame anyone thinking that Martinů 's Julietta is mediocre if they haven't heard what it can sound like. A full review with cast list will appear shortly in Opera Today. Photographs by Richard Hubert Smith, courtesy ENO. On BBC Radio 3 "The Choir" there's a piece on Xian Xing Hai's Yellow River Cantata, (黄河大合唱), describing a new edition in English to encourage greater awareness of the piece in the west. Good idea! But The Yellow River Cantata is so central to the Chinese psyche that I'm not sure that western performances would really help. In this increasingly monophone world, the last thing we need is more west-centrism. We need to learn things from other perspectives. Even Chinese raised overseas seem to be losing their identity. A better approach may be to listen to really idiomatic recordings, and develop a wider understanding of modern China. Only then, perhaps the Cantata and its true emotional impact will fall into place. Xian Xing Hai (Sin Sing Hoi in Cantonese) (冼星海;) was born 13/6/1905, the posthumous child of a fisherman in Macau, "the lowest of the low", as boat people were looked down on by farmers and townsfolk. Yet almost from the start he seemed destined to rise above extreme hardship. Aged six, he went to Singapore with his mother, who had a job as an amah. Yet, aspiration already. He studied first in an English school, then in a Singapore school affiliateded to Lingnan University, where he learned Chinese and western music. In 1918, mother and son were back in Guangzhou, struggling hard to put the son through music school. He was a clarinet prodigy, known as "The Southern Piper" because he'd grown up in the nam yang (south). At the conservatories of Beijing and Shanghai, he specialized in violin and composition. From the very start Xian worked with both Chinese and western instruments, though he composed in a western style. He wrote many musicology papers, including treatises on Chinese music. Already, he was fired by the idealism of the May Fourth Movement, who saw modernization as China's way forward "China has no need for private and aristocratic music", he wrote as a youth, "those who study music should take full responsibility to rescue China from its dormant state". Like so many Chinese progressives at the time, he went to Paris, where he studied with Paul Oberdorffer, Noel Géallon, Vincent d'Indy and Paul Dukas. Some Chinese students, like Zhou En lai, were wealthy, but the majority, like Ma Si Cong , struggled to survive. It was a sign of how dedicated they were. Xian returned to China in 1935, where he made a living composing music for films, including A Song at Midnight, (1937) the first Chinese horror movie, which is a lot more than just a horror movie. It's a commentray on politics and cultural change in China - read more HERE. . Movies in China weren't merely escapist entertainment, but a form of social education. Read more about that on this site. It's interesting to compare Xian Xing Hai with Hanns Eisler : both idealists, both intellectuals, both convinced that film was a means of reaching the masses. Both wrote serious art music, but also songs which could communicate with the less sophisticated, and both worked with progressive film directors. This period could be called "Chinese Weimar". The Japanese invasion proved a catalyst. Chinese people organized mass relief and charity efforts, music, theatre and film very much part of the process. Whereas European intellectuals were forced to flee from Hitler, Chinese intellectuals became drawn into the movement for national resistance. Some could go south to Hong Kong or Macau (Xian's birthplace) to continue their struggle, but Xian associated with the Chinese Communist Party and made the long march to Yan'an, where the partisans lived in mountain caves in primitive conditions. The Yellow River Cantata was written in the Yan'an caves, securing it a place in the Valhalla of Communist iconography. That's how I learned it as a child, broadcast full volume from CCP schools, night and day, during the Cultural Revolution. Only very much later did I learn it as proper music. It opens with a stirring rally. Already the "water" images in the music surge forward. "Friends" says the baritone, "listen to the song of the Yellow River". The choir sings the famous staccato chorus "Bai yao, bai yao", followed by a serene passage which suggests the eternal flow of a great, powerful river. "Bai yao, hey" sings the chorus (with bass drum) "...hey". The Huang Ho was known as "China's Sorrow" because it would flood and kill millions, yet it also fertilized the soil and became one of the cradles of Chinese civilization. The next two movements refer to 5000 years of Chinese history and the perserverance of the peasantry. The fourth movement is based on regional folk song. Hence the two simple vocal lines and minimal orchestral support that mimics traditional folk instruments. Then the full chorus joins in : the peasants will beat these new sufferings caused by the Japanese invasion. Then a haunting, elegaic melody. A soprano sings a lament for women, who for centuries have borne the brunt of suffering. As her voice rises, joined by full orchestra, one feels hope for a new society. The most famous section is the rousing "Defending the Yellow River", where full chorus sing a defiant round, expressing the peasant's struggle to beat off the invaders and remake a stronger, better China. What a blast this is, nothing like normal, polite choral fare. Moments of reflection, where "Chinese" motifs are heard, before the magnificent finale, announced by trumpets. "Ai ai, Huangho!" the choruses sing gloriously, faster and faster to a single note crescendo held for several bars. "Ai!" Perhaps it's propaganda music but it certainly reaches deep emotional chords in those who understand the history of China. That's perhaps why it means so much to so many people, who can hear the pain and dignity in the music, far deeper than the political context. It was even performed in Taiwan in 1991, where the Gou Ming Dang regime loathe everything about the Communists. That shows that the Yellow River Cantata surpasses boundaries and unites all Chinese, everywhere. HERE is a link to a very good documentary on Xian Xing Hai, with archive film and photos you won't see too often. Even though it's in Mandarin it's not hard to follow. There is a recent movie "Song of Star and Sea" (refering to Xian's given names which mean "star" and "sea". I've only seen the trailer but it looks awful. HERE is a link to the best recording, I think, by the Central China Orchestra and Chorus. Fabulous choral singing, and very sharp soloists. Much better than the Shanghai Philharmonic Orchestra and Choir recording, conducted by Cao Ding, used on the BBC Radio 3 broadcast. Xian Xing Hai wrote two versions of The Yellow River Cantata, the first in 1939 for the limited resources at Yanan, the second reorchestrated for larger orchestra and choir, written the following year in Russia, to which he travelled with the film director, Yuan Mu Zhi (袁牧之) who made Street Angel (1937), one of the icons in Chinese cinema. (read more here, with full download). Xian died of penumonia, exacerbated by poor treatment, in the Soviet Union in 1945, aged only 40. The Yellow River Piano Concerto isn't his, but a suite created by others, but is famous because it was performed in the US in the 1970's, part of the rapprochment between China and the US. Two clips below : The Central China Orchestra mentioned above and a People's Liberation Army version from 1956. It's a beautiful archive film, made by people for whom the Anti Japanese war was not theory but living memory. The "Vienna Myth" distorts music history. Everyone likes Strauss Waltzes and Klimt derived decorative arts. So if you want to make money, you repackage music in their image. But look more carefully though. Mahler, for example, couldn't wait to get out of Vienna and head for the hills where he could be creative. 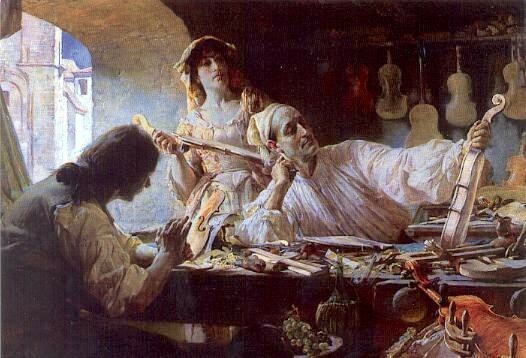 Vienna was where he made a living (for a while). It was not his life. Even Schubert, impoverished city boy as he was, was tranfixed by the Salzkammergut. We owe much of Schubert's music to Gmunden rather than Vienna per se (many of Schubert's friends knew the countryside well). Another popular myth : Romanticism wasn't necessarily "romantic" (though some of it was maudlin). Romanticism was revolutionary because it focussed on the individual rather than groups. It was an outgrowth of modern ideas on political liberty and freedom. It was the foreunner of modern ideas of identity and psychology. I've been writing about music and mountains for years because mountains are metaphors for many Romantic ideals. On a simpler level, walking was what people did before cheap public transport. Even in big cities people walked and climbed flights of stairs. If you were poor, you had no alternative. Please see my work on Mahler 3rd and 6th, on Strauss Alpensinfonie, Ernst Krenek's Reisebuch aus den österreichischen Alpen and much else. Today, I'll focus on one song that epitomizes the whole idea : Hugo Wolf's Fussreise. Wolf was perhaps the true country boy among Lieder composers, growing up in an impoverished family in provincial Windischgrätz (surrounded by mountains). Later, he walked from Vienna to Bayreuth. To him, hiking was as natural as breathing. Listen to those brisk, jaunty rhythms, repeated in the piano part. You actually can tramp to them, I've tried, singing the song while walking. Wolf knew about "frischgeschnittnen Wanderstab" (freshly cut walking stick). These help regulate walking rhythms. Optimistic, energetic. But the poet is Eduard Mörike (another man who preferred countryside to city). Almost imperceptibly the mood becomes more serious. "So fühlt auch mein alter, lieber Adam Herbst und Frühlingsfieber, Gottbeherzte, Nie verscherzte Erstlings Paradiseswonne." (my old, beloved Adam felt Spring and Autumn fever, given by God, never forgotten by those who were the first creations of Paradise). Wonderfully compressed German phrase which means that the spirit of Adam in Eden lives on in us when we experience the joy of Spring and Autumn). Mörike and Wolf refer to Adam and Eve before the Fall, suggesting that primeval bliss lives on in modern man when he interacts with Nature in Spring (growth) and Autumn (colour). "Wie an ewig neuen Schöpfungstagen" (like an eternally new Day of Creation). Mörike, a country parson, uses Bible terminology but emotionally, this "Creator" could be Dionysius or something even more ancient. But the greatest joy of this song, to me, is the way it expresses the physicality of walking, in its pace and in the tiny detail "leichten Wanderschweiße" (light "walking" perspiration). Mörike and Wolf know first hand what brisk walking means. Without effort, no results. Walking keeps you grounded. Definitely not salon aesthetic. Roderick Williams's programmes are always well chosen. At the Wigmore Hall, Williams picked 24 songs from 12 composers setting 15 poets. Some of these composers wrote hundreds of songs, so any attempt to suggest comparisons between them would be superficial. Anyone who knows the repertoire could come up with dozens of alternative choices. Williams's programme worked much more perceptively. It evolved in three stages, leading up to Ralph Vaughan Williams Songs of Travel, which occupied the whole second half of the recital. English song carries baggage. The genre evolved as a middle-class attempt to engage with vernacular culture. Vaughan Williams and his friends collected folk song from the "wild" so to speak and turned it into art. In the process, they found their own musical identity. Songs of Travel (1901-04) is very early RVW, written when he was emerging fom the shadow of Charles Villiers Stanford. Like many late Victorians, Stanford was interested in the common folk, but as quaint curiosities. In theory, Roderick Williams could have paired RVW's songs with Stanford's Songs of the Sea or Parry's Songs of Farewell, but they aren't piano songs. The very fact that RVW eschews grand settings indicates a change of aesthetic. In Songs of Travel, RVW is setting forth on his own creative journey, choosing Robert Louis Stevenson as his guide. The Vagabond sets the tone: Stevenson imagines a man who sleeps in the bush and dips his bread in a river : a swashbuckling Victorian adventurer, perhaps, inspiring nice middle-class boys with visions of H Rider Haggard and alternatives to the Victorian/Edwardian consumer mores. Immediately, though, RVW switches back to gentility. When Roderick Williams sings Let Beauty Awake, the quality of wonder he brings to the song shows that it's more than mortal love, but love of daybreak and of the day to come. Even more beautiful is Youth and Love. It's reminiscent of Silent Noon, with its languid sensuality. Again it's not a love song: the young man sets off "to a nobler fate". Williams sings it perfectly, his voice more agile than some of the baritones who have done this cycle. Indeed, it's songs like Youth and Love and Whither must I wander? which make RVW's Songs of Travel sunique. They are exquisite works of art that owe nothing to folk song, Victorian song or anything else. RVW is well on his way to becoming a true original. Hence the confident I have trod the upward and the downward slope, beginning in minor, ascending to heights which can tax some singers. Williams, however makes that last line "And I have lived and loved..... and closed the door" glow with feeling. He breathes into the words, stretching the legato so it seems to reach out beyond the song. RVW is "closing a door" and heading off to his future. It's this sensitivity that makes Roderick Williams easily the best singer of English song in our time. The more stolid songs, like The Roadside Fire with its sexist values, are popular, especially delivered in a forthright, authoritarian manner. "As if sung by a vicar", someone once observed. It's easy to understand why because that reinforces the idea of "English" song as worthy and safe. Then along comes Roderick Williams, singing with emotional directness, as if in normal conversation. His voice is burnished gold, yet clear and natural, releasing the beauty of English song as song, equal to almost anything in the European mainstream. The first part of Williams's recital covered German and English songs of travel in a nicely impreessionistic way. He's not the most idiomatic of singers in German - few British singers are - but we weren't there to hear him sing Lieder.for its own sake. His Ging heut' Morgen über Feld works not because it's part of the full Mahler set, bu is treated as a song on its own terms. He has done the full set rather well, but on this occasion the song was integrated into a wider traverse. The German songs also served to suggest what might be the difference between German and English song (a subject far too complex to deal with in any recital). Williams is renowned for his Finzi and Gurney, and his Ireland and Moeran were very good. But in typical Roddy W fashion, he added something different : Michael Head's Tewksbury Road (1974). It's a lively, expressive song. You can hear why Roderick Williams is one of Michael Head's great champions. Perfect for William's personal, warm-hearted and direct style. PS : one of the encores was Schubert Lied eines Schiffers an die Dioskuren but Roderick Williams regulars might know why he picked that. He sang Pollux, one of the heavenly twin stars (Dioskuren) in the ENO Rameau Castor and Pollux. Full review soon in Opera Today. Who is dreaming of whom? Martinů's opera Julietta at the ENO from Monday 17th. For my review, please see HERE. A man arrives in a strange village where nothing seems quite right. The villagers have no memories to bind them to reality, so things unfold without sense or connection. But what is reality? The opera’s subtitle is “The Key to Dreams”, which implies a search for meaning, whether or not it can be unlocked. From the orchestra emerges a lovely, haunting melody. The man thinks he’s heard it before, connected to a vague memory - a beautiful woman ? He’s determined to pursue the dream which seems to fade as fast as it unfolds. The woman is Juliette, shining bright and golden, “like a star in the firmament”. Deeper the man goes, into a dark forest, where he meets a Seller of Memories, who sells photographs of exotic places. The man buys into the images, convinced that they show his past with the woman he’s searching for. Eventually the man finds himself in The Central Office of Dreams which people enter and leave when they sleep. Closing time! warns the nightwatchman (who was also the Seller of Memories). Wake or you’re forever trapped! But Juliette is such a powerful, seductive dream that the man would rather remain in eternal limbo than lose her. Julietta is marvellously conceptual. Strange figures appear as they do in dreams. They feel full of portent, but what do they really signify? Are they signposts or red herrings? What is the nature of memory? Is memory truth, or an assemblage of images which we've rearranged ourselves? And why do we need dreams (and memories) at all? Martinů said that Julietta was the only one of his works that he would like to hear again. Hence, perhaps, he returned to it and revised in as he lay dying in 1959. More "memories" and "dreams". 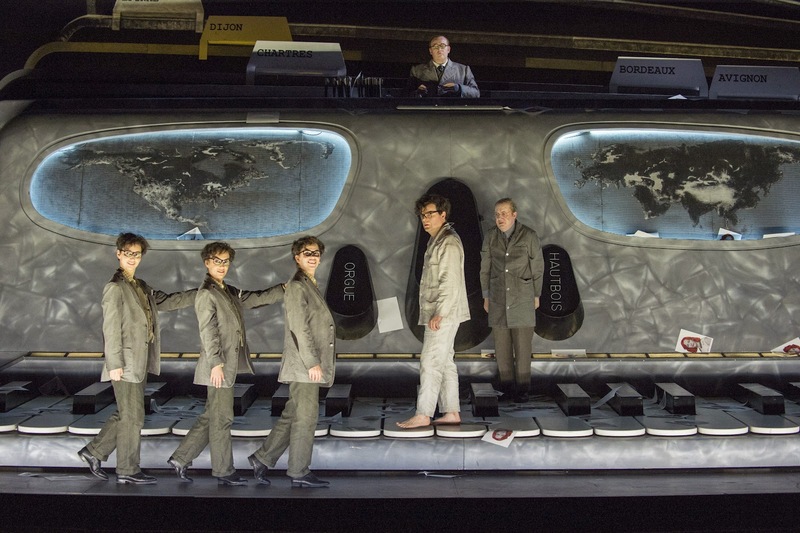 The ENO production is directed by Richard Jones, so expect modernist. See production images HERE. Obviously we can't tell by photos but this looks like he and his designer Antony McDonald are picking up on an important theme that runs through the opera. Listen to the opera yourself and hear if you can pick up on this. The benchmark recording was made in Prague in 1964, only five years after the composer's death. Jaroslav Krombholc conducts singers prominent in Pragiue Opera at the time - Maria Tauberova, Ivo Zidek, and Véra Soukupová. Martinů's Julietta received a major full performance in 2009, conducted by Jiří Bělohlávek with Roderick Williams in multiparts, William Burden and a gorgeous Magdalena Kožená. (read my review here). That's not available on CD though airchecks from the broadcast exist. It's superb and quite magical. It really ought to be released, as it was the first complete version, based on a new edition including passages not available in 1964. Above all, listen. Julietta is sung by Julia Sporsén in one of the biggest roles in her career, and the rest of the cast are ENO regulars. Susan Bickley sings the Fortune Teller which Soukupová sang for Krombholc. Lots more on Martinů on this site, please explore. Lone, incessant the sound of a flute weeps/ Widow graceful, in the dark tranquil/ - lost voice seeking exile from others/ - garlands of sound hiding the hour. And the orchestra? Kisses? Night outside, cautious, holds everything/ Modulate solo plays the mournful flute/ who to release it? Who to know the pain without reason? "Flower Boats" were barges where women sang and played music while men fooled about - a bit like brothels but not so blatant. So the "widow" is a woman who has fallen on hard times, sold into servitude.Pessanha is an interesting man because he strove to cross cultural borders. He went to Macau where he made a living teaching school, but made a life as an aesthete. He learned Chinese well enough to read the Classics and write in Chinese, and married a local woman, with whom he had several children. They lived in a small house off Praia Grande. He collected Chinese antiques, but I've seen the photos. Genuine of the period, but not outstanding, as he was not wealthy. He also "went native" to the extent that he became addicted to opium, Think Baudelaire, and other Europeans who dreamed of exotic places and sensations. There were other Portuguses who did similar things, including a man who lived in Japan and immersed himself in Japanese culture, a great friend of Pessanhas's. 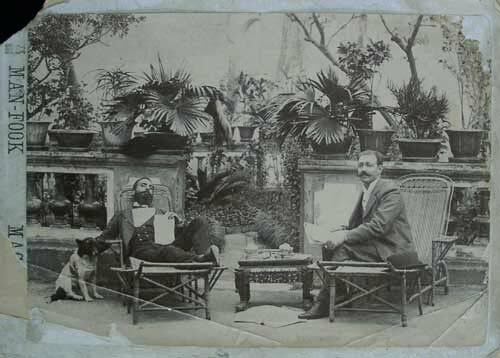 I'm not sure who the other man in the photo is but he looks too brown to be European, possibly local Macanese who were a completely mixed race community with customs and langiuage of their own. Pessanha and his son used to fight publicly, but the son died shortly after he did. They're buried together in the cemetery of St Michael in Macau. When I was working in the Macau archives (studying the theatre where Benjamin Britten sang on his visit to Macau in 1957), I knew Pessanha was buried almost on the other side of the wall, and kept wanting to visit. But it was 35 degrees C, I was in a hurry and tired and didn't stop by. Highlight of the 2012 Three Choirs Festival was George Dyson's The Canterbury Pilgrims, now available online on BBC Radio 3. So for those who couldn't make it to Hereford this year, enjoy! The Canterbury Pilgrims was a popular success after it was written in 1931. It's easy to hear why. It's straightforward, accessible and engaging, It begins cheerily, with elements of mock-medieval woodwind to jolly things along, for the pilgrims are setting forth full of hope. From the choir arises a solo. Alan Oke's clear, bright tenor arises from the chorus, like a shining medieval hero. This pattern of choir-solo-choir repeats throughout the piece, like panels in a painting, faithful to Chaucer's characterizations. Susan Gritton sings the female parts, like the Nun and the Wife of Bath, while Simon Bailey sings the parts for bass baritone. Significantly, Dyson varies the sequence. The Squire, for example is choral, as is the Merchant. Perhaps that reflects their place in worldly society. Dyson's writing is full of droll wit. Throught the 13 sequences, the imagery of prancing horses, giving jaunty momentum. A mysterious chill haunts the section The Clerk of Oxenford. It's a choral piece which undulates like monastic vespers, very different from the droll Monk. "Of a solemn and grave fraternity" sings Oke, describing the Haberdasher and his colleagues, as the orchestra creates steadier "footfalls", but The Merchant enters, the choir full volume, and assertive. Perhaps Dyson is referring to rivalry between Guilds and the irony of bumptious merchants going on humble pilgrimage? Dyson is witty but observant. The Sergeant of Law can have people killed, and the Doctor of Physic kills too, his medicine more superstition than science. The waving figures around the voice suggest bubbling potions and alchemy. Does Dyson identify with the Poor Parson, since his music (choral) is so beautiful? Dyson wasn't poor and had a successful career but the poetry in his setting suggests that he cared for the simple, humble man who comes last. Even the pace is less "horse" like, the sounds of the organ suggesting something more spiritual. Dyson doesn't do conventional piety, he does happy, and to some people that's dangerous. Beneath this sunny music there's something closer to the humility of Christ than to the trappings of Church and society. In this sense, Dyson's The Canterbury Pilgrims is of its time, even "modern". Martyn Brabbins conducts the Philharmonia: optimistic, crisp and brisk, like some 1930's British art and design. "In God's name, now let us rise" the tenor sings in L'envoi. Having told their stories, the pilgrims head off. A single, muted trumpet passage. Does this suggest a beginning, an end or the idea of an unending cycle of pilgrims seeking grace? The Wigmore Hall 2012-3 season (read more here) started with a gala of glamour. Dmitri Hvorostovsky attracts patrons in jewels and designer gowns. You could spot the Wigmore Hall regulars, looking out of place. Hvorostovsky was singing Rachmaninov songs and Shostakovich Suite on Verses of Michelangelo Buonarroti, both composers dear to his heart, whom he has often sung in recital. Hvorostovsky's huge bass baritone voice is capable of immense force, which makes him outstanding in operatic roles where the intensity of his singing releases great depths of colour. Hvorostovsky also has the ability to modulate tenderly, which suits the more personal Rachmaninov songs. His three encores at the end of the recital demonstrated how well he can sing Rachmaninov: a genuinely mysterious In the Silence of the Secret Night, suggesting subtle emotions. During the main programme, however, Hvorostovsky seemed more preoccupied with creating grand gestures like the huge "Da ty" (for you) in Zdes khorosho (How fair this spot, op 21/7 1902), and the flourish "Ya zhdu tebya" (I am waiting for you, op 14/1 1894). Forcefulness and volume appeal to many, but Hvorostovsky is capable of more refinement. The audience was happy, though, applauding every song. For Shostakovich Suite on Verses of Michelangelo Buonarroti, (op 145 1974), Hvorostovsky switched into a completely different mode. These songs are best known fully orchestrated, where their brooding majesty can be quite devastating. Hvorostovsky has made a speciality of this cycle in concert, so it was especially interesting to hear him sing it with only piano for support. It says much for him and his pianist Ivari Ilja that you could almost forget the wailing brass, booming percussion and rumbling dark strings in the full orchestral version. 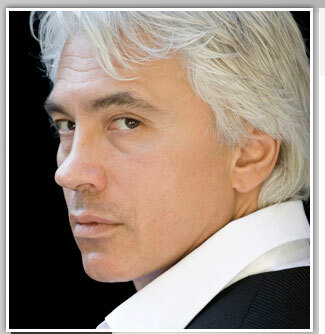 Heartfelt sincerity in Razluka (Separation), where Hvorostovsky breathes feeling into the long lines. In hushed tones, he reveals his true mastery. In this song the poet realizes that death is imminent, hence the timbre evoking solemn prayer. The savagery of Gnev (Anger) which follows is thus even more brutal. "For Rome is a forest full of murderers". Hvorostovsky and Ilja are so focused that the driving whip-like violence in the orchestrated version comes over even in voice and piano. Shostakovich references Christ's suffering, so Hvorostovsky's rock-like dignity is well judged. The piano prelude to Tvorchestvo (Creativity) can't quite match the hammer blows in the orchestral version, but Ilja beats rough-hewn staccato out of the Wigmore Hall piano, used to more lyrical things. Then Noch (Night) which connects to Tvorchestvo for Michelangelo was a sculptor, and the serenity he carves into this sleeping marble angel is the work of man as much as of God. Shostakovich wrote this cycle as he approached his own death, possibly anxious that once he was dead, the Soviets might suppress his music. Hence Bessmertiye (Immortality) with its almost jaunty capriciousness. "No ya ne myortv, khot i opushchen v zemlyu" (I am not dead, though I lie in the earth). Hvorostovsky intones with gravitas, but understands that the critical line rises gloriously, agilely upward "I am alive in the hearts of all who love" Ilja delineates the "shining" motif so it sounds like a balalaika, though it's also suggesting eternal light. Some of the glamour audience left before the Shostakovich songs. It wasn't that they didn't like him. On the contrary, maybe they knew how uncompromising they are, and that Hvorostovsky's interpretation was serious. Hvorostovsky was saving himself for Shostakovich, and it was where his heart lay in this performance. A longer version of this will appear shortly in Opera Today. Some of my friends were at the Last Night of the Proms at the Royal Albert Hall. Others like me were at the Wigmore Hall, and others at the Proms in the Park where they had a completely different programme (photo by Neil Rickards). We all had fun in different ways. One of the advantages of watching the Last Night of the Proms on TV is that the cameras see more than anyone else. Close-ups of friends in the Arena! The sillier the costume, the more likely the cameras will focus on you, but a lot of the"real" Prommers just don evening dress (which for them is fancy dress). I' won't forget Nick in a suit, or Sam's top hat (this year in a straw boater). Ruth always looks good but at the Last Night she's a diva, even when she's drinking a bottle of water. This year the traditional bobbing up and down was marred by a toy horn which threw everyone off beat but when it stopped, the bouncing was better. Thankfully, this year's audience cared about music. No vuvuzelas ! The first part of the Last Night usually delivers real music, which we had in ther form of arias from Puccini and Massenet sung by Joseph Calleja, Delius Songs of Farewell, and Bruch's Violin Concert no 1. Calleja is a natural showman, joining in the Last Night spirit with his red white and blue hoodie and Malta T-shirt ! Gosh, does he know how to work an audience. This is a true artist, no dumbing down. He sings well - of course - but he does the common touch with natural ease. He shone with sincerity. It must have been as good an experience for him as it was for us. As a violinist, Nicola Benedetti is fine, but can't quite let rip as Our Nige (Nigel Kennedy) might. but she played nicely. Danielle De Niese was a delight. She's intelligent, another natural communicator, not a bimbette. 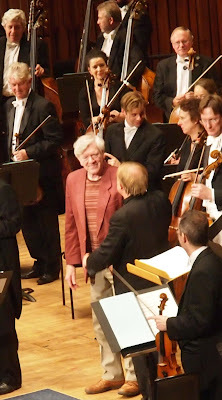 Jiří Bělohlávek conducted the BBC SO and BBC Symphony Chorus. A particularly beautiful Josef Suk Towards a New Life. Unidiomatic singing but genuine feeling. Bělohlávek is much loved. In his years with the BBCSO, he has made Czech a feature of his work. We've had groundbreaking performances of Janáček, Dvořák. Josef Suk and Martinů in London. We've been greatly enriched. Last year after the First Night of the Proms, Bělohlávek was attacked for reasons unknown. Surely anyone in a position to judge would know that Janáček comes in different forms? I don't speculate why, but Bělohlávek decided to spend more time in Prague, where he's much respected. Our loss, for Bělohlávek is in a unique position to teach us repertoire we can't claim to know better than he. So the warmth with which he was greeted at the 2012 Last Night was valedictory. He's looking much thinner, (has he been unwell?) but his command of the English language is greatly improved. In the past, he's struggled to read from a script. This year, he ad libbed comfortably, joked and led audience and performers like a seasoned Master of Ceremonies. LNOP conductors always make a speech, but this year Bělohlávek "was" part of the experience in every way. Olympic athletes paraded their gold medals. Bělohlávek put on his honorary CBE medal with reverence. Affectionate applause. Maestro, know that you're appreciated. This was the best Last Night of the Proms I've ever experienced. Less antics, more genuine heartfelt sincerity, emotional and musical truth. They left the best for last at this year's BBC Proms. Bernard Haitink conducted the Vienna Philharmonic Orchestra in Prom 75, Haydn Symphony no 104 (London) and Richard Strauss Ein Alpensinfonie. The previous evening, they'd played Bruckner Symphony no 9 so wonderfully that I was transfixed. And I don't normally get Bruckner. With Strauss and Haydn, Haitink and the Viennese ended the 2012 Proms season in a kind of apotheosis. 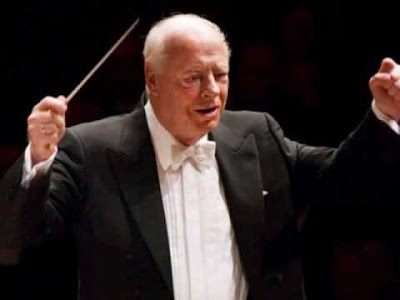 Haitink as conductor is philosophical, sometimes to the extent that you can't follow where he's goiing. For Haydn, he needed only a small ensemble, but from these he brought forth great richness and warmth. Benevolence, even, if such things can be expressed in music. Haydn was one of the last composers to endure servitude status, yet his Symphony no 104 exudes equanimity. To the Vienna Philharmonic elegance is second nature. Their Andante moved with grave dignity, a reminder that the state of grace of grace to come in the final movement was built on firm foundations. The melodic themes sounded truly "spiritoso", dancing with energy. Yet in the quieter passages,a moment of clean, pure joy. Someone once raged that Mahler never had a light-hearted moment in his life, which is nonsense. No normal, sane human being is an automaton. Haitink and the Viennese proved that happiness is a perfectly valid, even essential state of the soul. I heard echoes of The Messiah, and its exuberant, positive faith. Richard Strauss's Eine Alpensinfonie op 64 was written in 1915 when Germany and Austria were at war. Yet it's no escapist fantasie. Anyone who knows mountains knows that they can be dangerous, and that nature doesn't smile on mortals. It is fashionable these days to knock programmatic music, but only a fool would be trapped by literal readings of abstract sound. Eine Alpensinfonie operates on a metaphysical level. The Wanderer of the Romantic ideal is recreated in 20th century terms. The 22 "scenes" in this tone poem could represent a Hero's journey, as might the scenes in an opera. Yet the protagonist here isn't the literal embodiment of a personality but a much more sophisticated way of expressing theorteical concepts through music. In the "Meadows" sequence, we hear quiet, metallic cowbells, but they aren't merely decorative. In harsh alpine conditions, communities depend on cows, not farmland, Strauss writes long, flowing lines that suggest calm timelessness. But don't be lulled by the flute and horn melodies. Summer in alpine pastures is short. Significantly Strauss follows the "Meadows" with "Thickets". Darker, tenser sounds, suggesting anxiety. Fall from defined paths and you could be lost forever, down a ravine. The Glacier looms up. Low rumbling brass suggest something impenetrable; staccato, sibilant strings suggest tumbling, sliding surfaces. The section rises to an imposing crescendo. We are Auf dem Gipfel, on the peak, with nothing above but infinite sky. A glorious panorama in sound that suggest infinite possibilities. Then Strauss pulls a quiet oboe solo that emerges playing a poignant melody, a counterpoint to the massive walls of sound that came before. Expansive, majestic harmonies seem to reach into infinity. I thought of a time I stood surrounded by the great circle of peaks in the Hoher Dachstein. (photo shows the Hallstättergletscher, surrounded by the peaks of the Dachstein). Haitink and the Vienna Philharmonic give these magnificent moments a hymn-like quality, emphasized by sonorous organ, Trumpet and trombone figures like celestial fanfare, reminding us that we are mortal. Is this the "Vision" Strauss is referring to? Not in a literal sense, but a moment in which we comprehend our place in nature and the scheme of whoever created it. Glorious "peaks" in the music, then a sudden cutting off, which Haitink emphaises with great dramatic effect, for it is part of the meaning. We are plunged back into uncertainity. "Mist" rises from the deep valleys. In the eastern Alps the weather is treacherous, being caught on the slopes in a thuderstorm can kill. A brief moment of unnatural calm. In this wonderful playing, I could almost visualize the strange colour of light that precedes a storm. Electrifying rashes, hurrying passages. the huge Royal Albert Hall organ blasts menace. A percussionist winds the Wind Machine, other beat metal plates to suggest thunder and driving rain. Absolutely atmospheric. Yet there's more to this than weather. In the rapid descent from the peak, we hear te music of the "waterfall", driving, fast-paced figures (xylophone, harps, strings) sparkle, Beautiful, yet sinister. Haitink and his orchestra conjure up a kind of psychic madness in these scurrying decelerandos, whipped by the organ and metallic non-wind "wind" instruments. Then "rays", shafts of warm, glowing sound, evoking something gentler. The plucking of harps, delicious string textures. Led by the organ, another hymn-like theme arises, and the horns play a kind of counter reveille. Woodwind melodies remind us of the serene Alpine pastures of noon. Haitink makes the nocturnal mood sound just as serene, for Night is as important as Day in the life of the mountains. Incredibly beautiful playing, yet with emotional depth and humanity. The encore was a Johann Strauss II Waltz, designed to please the public for whom Vienna is a symbol of sugar-coated frivolity. After that amazing Richard Strauss's Eine Alpensinfonie, it sounded pretty but trite. I wanted to stay forever with Haitink and the orchestra in the Alps. "It's not a timpani orchestra, dear" said a lady at a Prom some years ago. "It's a symphony orchestra". A line to cherish! I loved that couple. Whenever I come across pseuds and snobs, I think of "timpani orchestras" and it restores my faith in the value of music. Tonight is effectively the real Last Night of the Proms. Tomorrow night is party time! But tonight, Bernard Haitink and the Vienna Philharmonic Orchestra wind up the musical side of things with Hadyn and Strauss. Everyone's got highs and lows. For me the best Prom was the last, the superlative Bernard Haitink/ Vienna Philharmonic Orchestra Haydn Richard Strauss Eine Alpensinfonie (more HERE) Also outstanding, Chailly and the Leipzig Gewandhaus Mendelssohn and Messaien/Mahler and Rattle/Berliner Philharmoniker Ligeti/Wagner/ Sibelius. Also loved Andris Nelson's CBSO Shostakovich (didn't review) and Martyn Brabbins Howells Hymnus Paradisi. Some seriously awful Proms. It's wrong, I think, to dislike a Prom because you don't like the composer. I hadn't heard Bernstein's Mass in 10 years but listened anyway. I'd forgotten how mesmerizingly awful it is. Perhaps it will serve as an inoculation. This year there's been much less "serious" music and much more feel-good filler. Top seller was the Wallace and Gromit Prom. Politically it's correct that the Proms should be all inclusive, but artistically that kills the very spirit of the Proms, which is classical music. Are the BBC that desperate? Hopefully, they'll find ways to limit the percentage of money spinning filler and increase serious classical music. A few years ago there was a Michael Ball Prom (popular crooner). His fans loved and sneereed at the rest of the Proms. If you run a business, you lose it if you change the product. If the BBC wants to grab a share of the West End market, the West End will fight back. Then what, if classical music lovers have been driven away? BBC Proms organizers have plans for years in advance but like any good business they probably have the next 5 years sorted. But there's still time to change trends. On a more domestic front, a Big Thank You to whoever told the door staff to let people in much earlier than usual. It makes complete sense, raises bar sales, shortens the queues for the toilets and makes things altogether more civilized. This year they even clamped down on latecomers, because latecomers disrupt things for other people. Hooray ! The BBC got flak during the Jubilee for bad presenting, but there's really very little anyone can talk about while small boats float slowly up a river for hours on end. The Proms however, are intrinsically more highbrow. Presenting is more difficult to do than it seems, because your mouth has to function independently of your brain. But it helps a lot if the brain is basically in the right place. This year we've been spared the worst excesses, and the female presenters are generally reliable. But then one of them starts to praise the idiot who disrupted the magical Mendelssohn Prom, and cheer the guy with flag-painted giant hands? Such things are fine for the Last Night of the Proms, but not otherwise. If the BBC is serious about serious music, they shouldn't be encouraging that sort of thing. Jascha Horenstein on Hanns Eisler, from Sinn und Form, 1964. With many, many thanks to Mischa Horenstein, who runs the Jascha Horenstein page on Facebook (link here). This occurred in Vienna in 1912, and this first meeting is clear in my mind even today. The noisy atmosphere of a sports stadium was certainly a much better place to begin a friendship with Hanns than the rather aristocratic ambiance of the Vienna Opera would have been. At first sight he seemed comical to me. Even his clothing was somewhat absurd. It was as if part of his dress had come out of his father's closet, and the rest out of his younger brother's. The overall impression was that his suit was at the same time too large and too small. And as if that weren't enough, the thirteen-year-old already had the bald head of a forty-year-old. If one can imagine that, on top of a rather short-built body sat a large head, with a cheerful, full-moon-shaped, mischievously grinning face, which at every turn revealed a bald head, then it will be easy to understand that, after more than 50 years, I cannot forget this first impression of Hanns. He had the voice of a child, and this voice would often break, even in later years, and it broke especially when Hanns was excited. And when wasn't he excited! This often shrill, "unmusical" voice was a very important component of his arsenal used in endless discussions, as it was no longer used for the end of a soccer game, but rather for more serious things. You could hear this voice a few years later when Hanns, at that time already a prospective student of Arnold Schönberg, dressed in the uniform of an Austrian army which no longer exists, leading all-night discussions in the barracks in Grinzing, on the one hand about the music of Schönberg and Webern, and on the other hand about the events, consequences and views of the Russian Revolution of 1917. This voice reached its highest tone, that of scorn, when his polemic vented itself in the extreme against the "splendid isolation" of the Vienna composers of that time who counted for something, against their "art for the sake of art" attitude, against their disdain for the historical events which had literally unhinged the world. At that time only one man was granted the limitless mercy of the merciless Hanns: Arnold Schönberg. The esteem, love, admiration and devotion that Eisler felt and demonstrated for Schönberg can hardly be explained without the help of psychology or psychoanalysis. Schönberg was for Hanns neither the greatest composer or painter, poet or thinker, nor the greatest musician and teacher: to him he was simply the greatest. Period. It was that way when Hanns was 20 and it remained so until Schönberg's death. I remember one afternoon at Schönberg's house in Los Angeles—it was 1944 or 1945—when Hanns literally became deathly pale because I had dared, during a conversation with Schönberg at tea time, to contradict a remark made by Schönberg. On the way home from Schönberg's house, Hanns was rather depressed and short-tempered. In order to provoke him, I turned the conversation around to Schönberg—his character, his music, his many remarks about contemporary artistic questions which had been the topic of conversation that afternoon. And then I asked Hanns what he thought a socialist society should/would do with a man such as Schönberg. "Ah," said Hanns, and his mood changed instantly from grouchy to cheerful and boisterous. "A wonderful palace would need to be built for him, completely out of glass, of course, with wonderful gardens, large fountains, and colorful exotic birds. And in this glass house would sit the old man, painting his twelve-tone rows in gigantic notes, undisturbed by what was going on in the world, while the rest of us, outside, on the periphery of his glass palace, would build up socialism. Thus should Schönberg live until the end of his life, like the Caliphs in the Thousand and One Nights." When Hanns' listeners would not go along with him, as would sometimes happen in the barracks in Grinzing, then he would appoint himself as his own audience, stage boos, and finally maneuver himself into some corner from which there was no longer a way back, and then there would be a detour through lots of laughter. And who, of those who lived it, could forget the crescendo, the accelerando, the heavenly boisterousness, and the uninhibited happiness of his laughter. Or instead Hanns would act dumb, in a way that only few can do. During his indescribably hard studies with Schönberg, I sometimes heard comments from Hanns which convinced me that he had already at that time, perhaps only intuitively, sought a communicative basis in music. We see in his development only a short period in which he was attracted to the "New" per se. The piano sonata, the duet, the "Palmström Songs belong to this period. With the fresh, aggressive "Newspaper Clippings" (Zeitungsauschnitte) he "attempted—through a radical, anti-traditional manner and through "persiflage" which reminds one with its open brutality of Georg Grosz—to point out and make fun of the decades-old unbearable, accumulated pseudo-romantic bombast. Because at that time, the end of World War I, the "New" could be realized only through the shock effect. Eisler very soon tired of this "commoner-shock" attitude. "New" as a goal in itself no longer interested him. Events forced him to "express his opinion"—the intensification of the political situation forced decisions. The composer Eisler, whose musical language, under the influence of Schönberg, was tied to late romanticism, from which he forged a style that belonged more to "art for art's sake" than it corresponded to the need for a communicative basis, decided, and to be sure with a certain suddenness, on an almost heroic step: to write, on the basis of communicative art and with materialistically very modest means, music which was simple, sound, optimistic and powerful. The opinion is often given, especially in America, that it was Bert Brecht who caused this change in Hanns. That is nonsense. Hanns underwent this change at least five years before he met Brecht. The editor of this memoir—and this publication does not deal with anything else—does not have the intention of giving an aesthetic valuation of the works of Eisler, and particularly not of those written in collaboration with Brecht. Only one detail should perhaps be mentioned, namely that this change in style was by no means unconditional—and therefore by no means a definitive renunciation of the "first" post-romantic period. In many compositions, expecially the songs for voice and piano which were written in America during the war, one can find numerous elements of an almost Schubert-like tenderness and beauty with a very nostalgic undertone of the Austrian countryside. Hanns Eisler was not a radical anti-Romantic. Under a tough exterior (lit. "rough shell") was hidden a very sensitive, warmhearted musician. What was unbearable to him was the esoteric jargon of the contemporary lyricists—especially Rilke. With his outspoken taste for caricature, Hanns could in inimitable ways improvise poems "à la Rilke," and he would accompany the recitation of such an improvisation with a grotesque choreography of classical ballet. It's not that he had no sense for great lyrics. He knew his Goethe, he loved Morike and Hölderlin, and of his contemporaries he valued the poetry of Berthold Viertels—but the mystical symbolism of a Stefan George or Rilke could not win him over. I remember one incident very clearly, when Hanns was looking over the composing attempts of a musician friend. This happened in Vienna, around 1920. He sat at the piano; in front of him lay the musical arrangement of a Rilke poem. Hanns played the first few opening bars and then began to sing the first lines of the song, "The evening is my book...." He stopped here suddenly and shrieked with all his might: "But that is impossible! One cannot compose such a thing! The evening is not a book, the evening is a newspaper, and to be sure a...." And now broke forth a waterfall, a cascade—a gruesome, true-to-nature description of a Viennese afternoon newspaper called The Evening. And this description was no compliment to this newspaper or its publishers, as one can easily imagine, and certainly no compliment to Rilke or the young composer. In literature, Hanns was already very experienced as a young man. Today he must be especially given credit for the fact that he was the only one of the young men and also the only one among the Schönberg circle who did not unconditionally accept Karl Kraus. I have him to thank for my first acquaintance with the great French romantic novelists. Stendhal was his great love. When I once spoke enthusiastically of a novel by a Russian author, Arzybaschev, he merely schrugged his shoulders and the corners of his mouth, and he said, "You must read Stendhal." A few days later he brought me the "Chartreuse de Parme" in German translation. He had a great admiration for French literature, [but] much less for French music, and no understanding at all of French painting. He was not a visual person. He was proud of his French heritage, somewhere on his paternal side. When he mentioned Robespierre, Danton or Marat, it was as though he were speaking of his cousins. But he was equally proud of his rural, Saxon heritage from his mother's side. I believe that in certain phases of his life, cynicism and tactics hid behind the face which he presented to the public. Without perhaps realizing it himself, he suffered immeasurably from the fact that he did not succeed at reaching the reality of the proletarian. He could not alter his character. Despite a light, perhaps too easily comprehensible musical idiom (which he put aside after his return from America in 1948) which was supposed to meet the challenges of its era and place of composition, a style which got on the nerves of educated musicians and irritated and horrified the sophisticated listener, he lived and died as a radical, anti-subjective but late middle-class artist, certainly as a creature of the nineteenth century and as a musician of the late-romantic Viennese school of Arnold Schönberg. Eisler had a pronounced talent for friendship. His good will, patience, and his compassion for his colleagues were of quite a rare variety. Professional circumstances sometimes made it necessary for Hanns to come together with composers whose music had very little worth or was altogether worthless. It was an extraordinary drama to observe with what friendliness and politeness Hanns dealt with these musicians, as if he had to compensate for their endless bad luck, namely their lack of talent, with an extra measure of good. Hanns and I came through many bitter years of Hitler and emigration side by side. Our last meeting, several years ago, took place in Vienna, not far from the soccer field in the Prater where we first met in 1912."